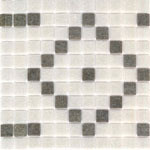 Choose colors from our 3/4" x 3/4" tile series, including Aventurine, Classic, Luster and Pastille. Ideal for spas, pools or any border project. Prices listed are for colors shown; price varies depending upon colors selected. For more information, e-mail info@hakatai.com or call 888.667.2429.